The city with the most expensive daycare in Canada is? The fifth annual report on child care from the Canadian Centre for Policy Alternatives (CCPA) was released today, and it confirmed what you probably already know and fear: daycare fees remain unaffordable in most Canadian cities, and as in previous years, these already sky-high costs are continuing to increase at a rate higher than that of inflation. (In the Toronto suburbs of Brampton, Mississauga, Markham, and Vaughan, for example, child care costs are up between five and nine percent, which is two to three times greater than the inflation rate.) The report provides a snapshot of median child care fees in Canada?s 28 biggest cities, looking at full-time care of infants, toddlers, and preschoolers at both larger centres and licensed home daycares. Shocking nobody, Toronto still tops the list in the infant and preschooler categories. 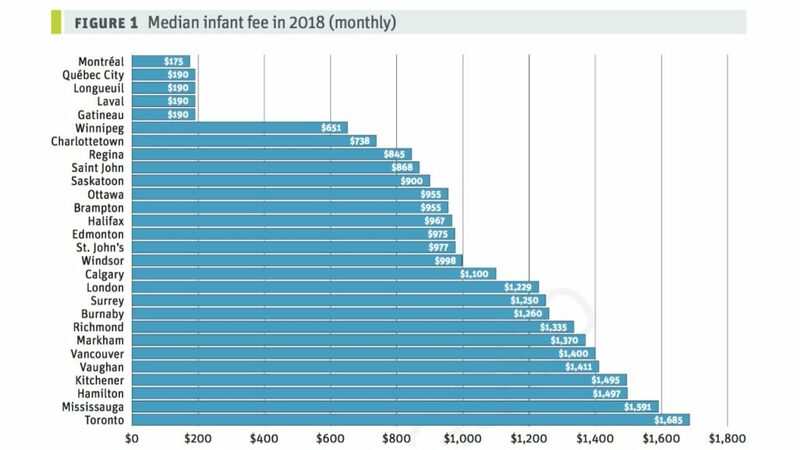 An infant spot in Toronto (typically meaning children under 18 months old) will set you back $1,685 a month, or a whopping $20,220 a year, which is basically the cost of a second mortgage. A preschool spot in Toronto is $1,150 per month. Nearby Mississauga and Hamilton are close behind, with infant fees of $1,591 and $1,497 a month, respectively.